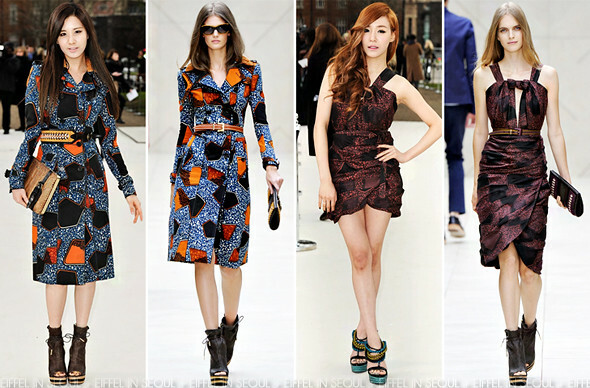 The three beautiful ladies of Girls' Generation, Seohyun (서현), Tiffany (티파니) and Yoona (윤아) were seen at the Burberry Prorsum Fall/Winter 2012 womenswear fashion show held during London Fashion Week at Kensington Garden in London, England on February 20, 2012. Seohyun (서현) opted for a printed coat from Burberry Prorsum Spring/Summer 2012 collection. Styling it similarly to the runway with a different belt and clutch. Tiffany (티파니) wore a red printed dress, modified to her fit from the same collection. A pair of beaded leather sandals to complete her look. Only thing I like about this outfit is her auburn hair and those sandals. Yoona (윤아) wore a green pleated dress from the same collection. A clutch and wedges from Burberry to complete her look. Unsure about the length of her dress but she looked beautiful. Both Tiffany (티파니) and Yoona (윤아) were seen wearing Burberry Prorsum coats at the fashion show.